A "foray" is defined as an initial attempt, so it was an incorrect use of that word. It would be comparable to saying, "Elon Musk introduced the Model 3 today as he launched Tesla's foray into electric vehicles." Not in my dictionary. A foray is "a sudden attack or incursion into enemy territory, especially to obtain something; a raid." It doesn't have to be an initial attempt. The word "foray" seems to trace back to an Anglo-French term for "raider" or "forager". The word probably has the wrong implication when applied to a commercial offering to the public, like the HomePod. The ongoing debate here is a prime example of how irrelevant comments can derail the discussion, particularly when the comment in question is one of the very first ones on the article (and thus one of the first ones everyone reads). I'm deleting the comment and all subsequent talk of it, not because I'm particularly sensitive, but because it's not relevant to the story at hand. Readers who want to point out typos or have grammatical debates are able (and encouraged!) to contact us via email, or twitter, or elsewhere outside of the comments section. Also, feel free to check out our handy dandy commenting guidelines while you're at it. 1) Nope, but that’s by design. 2) The big feature fanatics have been jacking each other off over—despite not have ever tested it—is the ability to place it anywhere (reasonably) in a room and have it intelligently adjust how the sound leaves the teeeters to idealize itself for an environment. I too am suffering this type of wait. Just tried asking Siri for the time from way across the great room, whilst playing really loud music and holding my iPhone close to me. The iPhone Siri motion graphic displayed but nothing happened on the phone, it didn't answer, the HomePod quietened down and told the time and went back to the music. My gosh it's powerful. Beamforming performance is still limited to 1) fundamental sound propagation principles, 2) the physical characteristics of the speaker array and how it relates to beamforming, 3) the speaker enclosure design, and 4) the physical geometry of the room. 1) Sound propagation is frequency dependent. Low frequencies have less directionality and tend to flood the room with sound rather than having a discernible source location. Woofer and midrange speaker cones improve the directionality of low frequencies somewhat but at the extremes, like subwoofers, the speaker placement is much less critical other than to avoid echos and standing waves/resonance. High frequencies on the other hand are very directional and tweeter projectors/cones/openings are designed to help spread the high frequencies sound to reduce overly extreme directionality. A lot of popular music is heavily biased towards the lower frequencies so the composite sound will be naturally less directional. 2) Transmit beamforming (speaker array sound projection) is basically the superposition of sound from multiple individual speakers. An individual unbaffled sound projector will produce sound omnidirectionally, i.e., no beams. When you add in a second sound projector next to the first one the effect of beamforming will produce a single donut shaped beam, but a beam that's lacking left-vs-right and up-vs-down directionality. Adding additional sound projectors in the same linear plane will produce additional donut shaped beams all still lacking left-vs-right and up-vs-down directionality To obtain left-vs-right directionality you have to wrap the sound projectors into a cylindrical or spherical shape and baffle (block) the parts of the beams you don't want, like the up and down and backside parts of the donut, which is what Apple is talking about when they refer to "ambient" beamforming. 3) While the active beamforming done by the onboard DSP creates the donut shaped beams the ambient beamforming effects are the result of the enclosure design, i.e., baffles and openings (apertures). The net result are a series of beams that project out like the petals on a flower when viewed from above. Most but not all of the undesired parts of the beams are suppressed but less so for lower frequencies because of the general lack of directionality of lower frequencies. About the only thing Apple can practically do to achieve a stereo effect is to manipulate the sound levels and source channel data (stereo left vs right) that are directed to specific beams. But with so few sound projectors they are only producing a limited number of beams and the beam widths are fairly wide and overlap quite a bit. Couple that with the preponderance of lower frequencies and there's only so much they can do for stereo effect and directionality. If you look into sonar and radar systems that rely heavily on beamforming the number of projectors is often in the hundreds and sometimes over a thousand and they are arranged in 2D planar, cylindrical, or spherical arrays so they can form highly directional and steerable pencil shaped beams. 4) The room interferes with the projected beams because echos further superimpose themselves on top of the projected beams. If you're standing in the room you're hearing a mix of both projected sound and reflected sound. Apple does apply compensation to try to minimize the negative effects of echos and standing waves but they can't prevent echos and standing waves, only deemphasize their effects. And again, the lower frequencies tend to flood the room with nondirectional sound and the reflection of low frequencies act like additional low directionality sound sources and reduce the stereo separation sound effect. 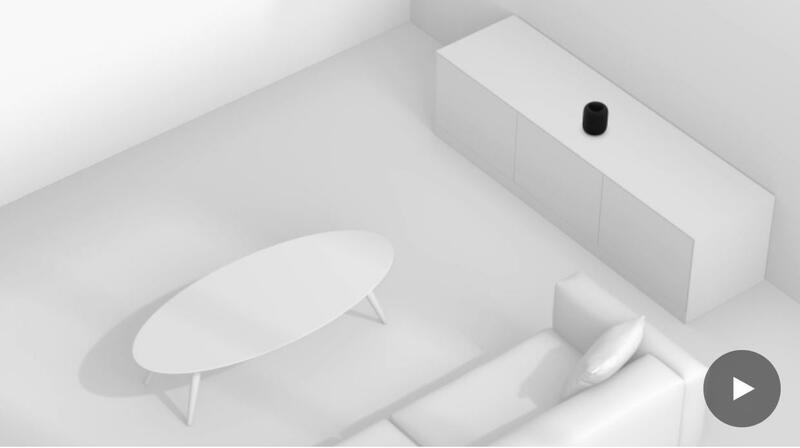 I'd bet that in a lab or anechoic chamber with pure sound tones the stereo sound effect produced by the HomePod is quite spectacular for what it is. But in a real listening space and with composite sound sources its going to be less precise but still better than if they were not performing any of the advanced sound processing that they are doing to make the listening experience better. Neil, you said: Upon unwrapping HomePod, the top of the box slides off to reveal the speaker sitting upright. I agree. I just packaged the empty box all up again to store but I just could get that amazing clear plastic wrap that seemed only held by static back on again lol. 2) Transmit beamforming (speaker array sound projection) is basically the superposition of sound from multiple individual speakers. A individual unbaffled sound projector will produce sound omnidirectionally, i.e., no beams. When you add in a second sound projector next to the first one the effect of beamforming will produce a single donut shaped beam, but a beam that's lacking left-vs-right and up-vs-down directionality. Adding additional sound projectors in the same linear plane will produce additional donut shaped beams still lacking left-vs-right and up-vs-down directionality To obtain left-vs-right directionality you have to wrap the sound projectors into a cylindrical or spherical shape and baffle (block) the parts of the beams you don't want, like the up and down and backside parts of the donut, which is what Apple is talking about when they refer to "ambient" beamforming. 3) While the active beamforming done by the onboard DSP creates the donut shaped beams the ambient beamforming effects are the result of the enclosure design, i.e., baffles and openings (apertures). The net result are a series of beams that project out like the petals on a flower when viewed from above. Most but not all of the undesired parts of the beams are suppressed less so for lower frequencies because of the general lack of directionality of lower frequencies. About the only thing Apple can practically do to achieve a stereo effect is to manipulate the sound levels and source channel data (stereo left vs right) that are directed to specific beams. But with so few projectors they are only producing a limited number of beams and the beam widths are fairly wide and overlap quite a bit. Couple that with the preponderance of lower frequencies and there's only so much they can do. If you look into sonar and radar systems that rely heavily on beamforming the number of projectors is often in the hundreds and sometimes over a thousand and they are arranged in 2D planar, cylindrical, or spherical arrays so they can form highly directional and steerable pencil shaped beams. I'm still at work, but I can see my HomePod sitting at my front door via my security camera. I also noted that when I placed in the center line of the room (under the wall mounted TV) it was still obvious when the location moved a little to the left or right.